Watch out currency, there’s a new kid in town. You might have been hearing a lot about a new payment method – Bitcoin. Bitcoin has been becoming more and more popular over the last 5 years so it is time we all had a little bit more information to understand this innovative payment network and new kind of money. Bitcoin is a mobile app or computer program that provides a personal Bitcoin wallet and allows a user to send and receive Bitcoins (a new type of money) with them. Bitcoin is not overseen by a central authority or a bank. The public network itself manages transactions and the issuing of Bitcoins. Everyone can participate in the Bitcoin system for transactions needing an exchange of payment. Bitcoin is attractive to people and businesses because it provides fast transactions between 2 parties, international payments, and low processing fees. Another benefit is that there is no special limitations on the minimum or maximum amount of money you can send. I will focus just on bitcoin for individuals to give you a base of information on which to build. Bitcoin is the simplest way to exchange money at very low cost. Instead of having to go to a store and swipe a credit card or sign anything, a person can just display what is called a QR code in their Bitcoin wallet application and the other party can scan that phone to receive payment. It is even possible to send a payment without revealing your identity, similar to money. Ease of Payment – Payments can be sent anywhere in the world at any time. There are no bank holidays, borders, or layers of approval requirements. Merchants can expand easily into new markets where credit card transactions may not be available or fraud rates are high. Lower Fees – There is no fee to receive Bitcoins, and you can control how big a fee to spend when spending Bitcoins by accepting various levels of confirmation speeds. Fees are unrelated to the amount transferred, so it’s possible to send 100,000 bitcoins for the same fee it costs to send 1 bitcoin. These fees are much lower fees than fees to send money with PayPal or credit card networks. Better Security – Bitcoin transactions are secure, irreversible, and do not contain customers’ sensitive or personal information to prevent identity theft. This protects merchants from losses caused by fraud or fraudulent chargebacks. Level of Acceptance – Since Bitcoin is a new way to transfer money, many businesses still have not accepted this method of payment, but the list is growing. Volatility – Because of the newness of the market and the number of businesses involved, small events, trades, or business activities can significantly affect the value of a Bitcoin. Changes in the Process – Bitcoin software has with many incomplete features in active development. First, you install a Bitcoin wallet on your computer or mobile phone. You then receive a Bitcoin address where you can get people to pay you, or pay other people. Think of setting up a new email address. This is how the Bitcoin address works, only you only use it once. You set up a new one with each new transaction. Bitcoin transactions are secure because they use a code called cryptography to make the information secret. Money cannot be charged to a user or a payment made without security steps taken which protect from people taking your money. Data about balances and transactions is encrypted so only those people authorized can view the information. Each wallet has a secret piece of data which is used to sign transactions. This ensures that the transaction comes from the owner of the wallet. It also prevents transactions from being altered in any way. Any confirmed transaction issued with Bitcoin cannot be reversed; they can only be refunded by the person receiving the funds. That means users should take care to do business with people and organizations they know and trust, or who have an established reputation. For their part, businesses need to keep control of the payment requests they are displaying to their customers. Bitcoin can detect typos and usually won’t let users send money to an invalid address by mistake. When paying for a transaction by bitcoin (this will be listed on the business’ website or on their invoice) you use your balance in your Bitcoin account. You may have a balance in your Bitcoin wallet from previous payments you have received from goods or services you have sold, or you can purchase Bitcoins on a Bitcoin exchange. When you purchase Bitcoins on an exchange, they will tell you a “Buy” price at which they will buy Bitcoins, and a “Sell” price at which they will sell you Bitcoins. This is similar to a foreign currency exchange rate. No fees are charged to buy or sell Bitcoins. The Bitcoins will then be put in your Bitcoin “wallet” to be spent. The price of a bitcoin can unpredictably increase or decrease over a short period of time because it is a new and novel system and sometimes the supply and demand of Bitcoins make it difficult to match transactions quickly. Consequently, keeping savings with Bitcoin is not recommended. Bitcoin should be seen like a high risk asset, and money should not be stored there for any period of time. When payments are received with Bitcoin, find a service provider to convert them to local currency. Bitcoin payments are easier to make than debit or credit card purchases, and can be received without a merchant account. 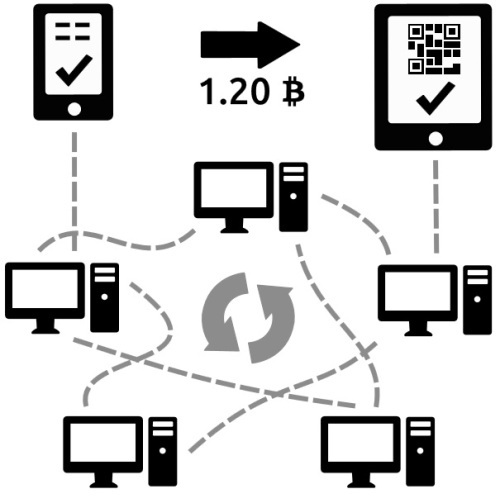 Payments are made from the Bitcoin wallet application loaded on a computer or smartphone, by entering the recipient’s address, the payment amount, and pressing send. To make it easier to enter a recipient’s address, many wallets can obtain the address by scanning a QR code or touching two phones together with NFC technology. Bitcoin is the first implementation of a concept called “cryptocurrency”, a new form of money that uses cryptography to control its creation and transactions, rather than a central banking or government authority. The Bitcoin protocol and software are published openly and any developer around the world can review the code or make their own modified version of the Bitcoin software. All users are free to choose what software and version they use. In order to stay compatible with each other, all users need to use software complying with the same rules. Bitcoin can only work correctly with a complete consensus among all users. Therefore, all users and developers have a strong incentive to protect this consensus. Bitcoin should be treated with the same care as your regular wallet, or even more in some cases! Getting to know the basics by researching Bitcoin is your best option.